News updates on Super Typhoon Ruby (Hagupit) and storm signals from state weather bureau PAGASA as of Friday, December 5 are posted on this page. Government forecasters said Bagyong Ruby has slightly weakened as it continues to move West Northwest towards the Eastern Samar and Northern Samar area. Expected landfall: Saturday evening over the Eastern Samar-Northern Samar area and it will be associated with strong winds, 3 to 4 meters storm surge and heavy-intense rainfall. Estimated rainfall amount is from 7.5 to 20 millimeters per hour (heavy to intense) within the 600-km diameter of the typhoon. Ruby and the Northeast Monsoon will bring rough to very rough sea conditions over the seaboards of Northern Luzon, eastern seaboard of Central and Southern Luzon, seaboards of Visayas and over northern and eastern seaboards of Mindanao. Fisherfolks and those using small seacraft are advised not to venture out over the said seaboards. Expected Exit PAR: Wednesday morning (December 9). 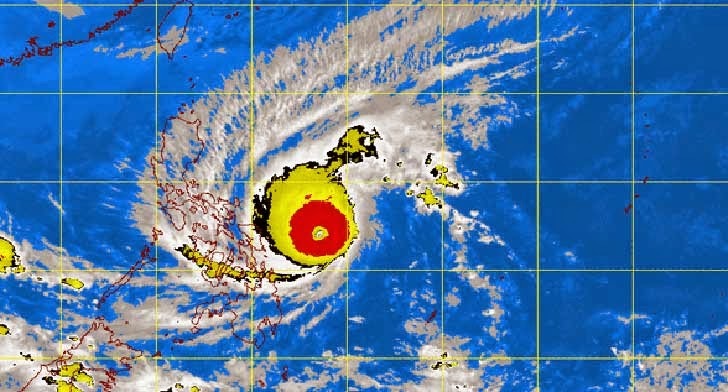 At 6 p.m., its eye was spotted 340 kilometers East of Borongan, Eastern Samar, packing maximum sustained winds of 195 kilometers per hour near the center and gusts of up to 230 kph. 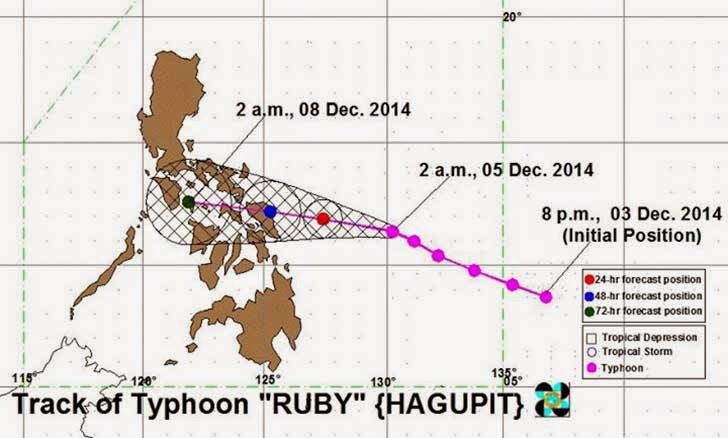 Ruby is forecast to move West Northwest at 13 kph. On Saturday afternoon it will be 80 km North Northeast of Borongan, Eastern Samar or at 130 km East Southeast of Catarman, Northern Samar, and on Sunday afternoon, its location will be 40 km North of Masbate City, Masbate or in the vicinity of Ticao Island.